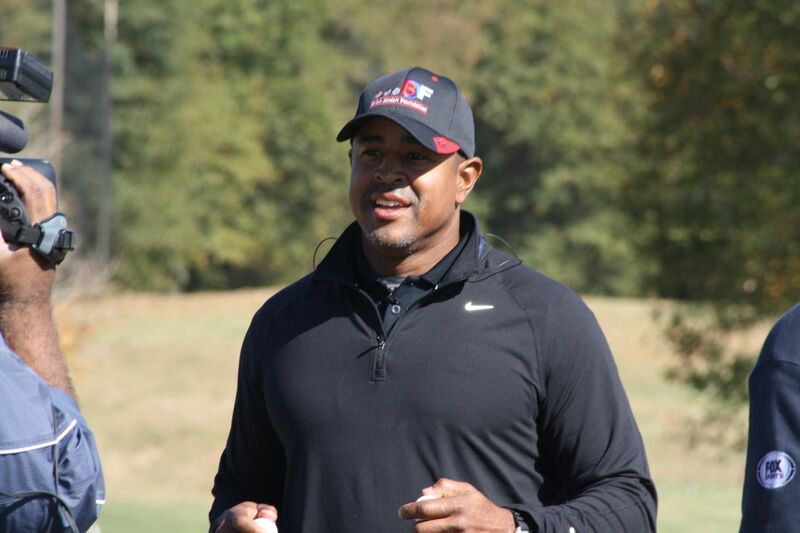 Two-sport superstar Brian Jordan who played three seasons in the NFL and 15 seasons in MLB, founded the Brian Jordan Foundation (BJF) in 1998. BJF has helped many students experience the dream of a college degree, taught children the fundamentals of baseball, equipped hundreds of young students with back-to-school supplies and encouraged countless others about the importance of reading. The Foundation is dedicated to building healthy minds, strong bodies and supporting places to grow. Over the past 17 years, the Brian Jordan Foundation has given scholarships to students in Georgia, Baltimore and Tennessee with hopes of spreading across the South in the coming years. Jordan is set to host multiple events around Atlanta from October 24-26 to raise funds and awareness for the Brian Jordan Foundation (BJF). The Charity Weekend includes both private and ticketed events open to the general public. The Foundation’s goal for the Charity Weekend is to fund 16 college scholarships for deserving high school students in the Class of 2016, an increase from the 12 given last year. With an even bigger Charity Weekend this year, the events kick off on Saturday, October 24 at 6:30 p.m. where Fans Compete against the Celebrities in tournament-style events (bowling, billiards and ping-pong) to win prizes and raise money for literacy. The event will be open to the public and will be held at Dave & Busters in Lawrenceville (5900 Sugarloaf Parkway) and includes dinner. It’s recommended you RSVP to participate in the games by calling 678-804-9562. On Sunday, October 25 at 11:00 a.m. sponsors will have an opportunity to play in a private Two-Man Scramble Golf Tournament held at Chateau Elan. Later that evening, fans can rub shoulders with the celebrities, listen to rising country music star Matt Stillwell perform on stage and bid on amazing, one-of-a-kind items at auction at the Draft Party. To close down the eventful weekend at 10:30 a.m. on Monday the 26th, the Celebrity Golf Classic at Chateau Elan, the celebrities will be paired with each foursome and there are spot prizes throughout the course. There will be a number of celebrities attending the events including baseball legends Ozzie Smith, Ivan “Pudge” Rodrigues, Phil Niekro and Gary Sheffield; football legends Tony Dorsett, Warrick Dunn and Jessie Tuggle; and basketball legends Julius “Dr. J” Erving, Kevin Willis and Dale Ellis. Among the major partners for this year’s Foundation Weekend include: Wells Fargo, Cigna Health Care, Georgia’s Own Credit Union, SunTrust Bank, Morgan & Morgan Law Firm, Delta Airlines, Bank of America, BB&T, 92.9 The Game, Dave & Busters, Carrabba’s Italian Grill, Simply Beverages, Chick-fil-A, Heineken and Georgia Power. On July 2nd, the Brian Jordan Foundation began its partnership with Kennesaw State University. “My ultimate dream has finally come true to be to build a center for excellence. Housing single-parent, underprivileged families — to practically raise them through Kennesaw State.” Brian Jordan Foundation and LakePoint will come together to build the Kennesaw State Brian Jordan Center for Excellence in Emerson, GA, a professional development building that will house underprivileged families and guide them through a social work program at Kennesaw State. In addition, the sports’ management will be available to train kids in this particular field if they choose.